I promised more pictures, and here's one of my favorites. Let's face it, people: You can put the woman in a fancy dress, slather on the makeup and false eyelashes, and throw jewelry and a manicure in the mix, but she's still the same Jen. 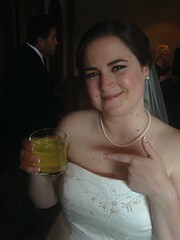 I always do the Dew, even on my wedding day. My friend Lisa Scanlon Mogolov got this great shot, but our fantastic photographers Max and Cyndi from Hitched Studios got even more. Check them out on their blog, if you're so inclined. I'll try to make this my last wedding post, but somehow, it seems unlikely.